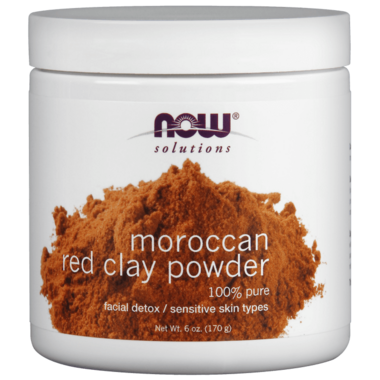 NOW Solutions Moroccan Red Clay Powder is a natural powder clay that is highly absorbent and mixes easily with water and other moisturizing products. It serves as an excellent facial cleanser and purifying masque, especially for individuals with sensitive skin. This product is great for detoxification to remove impurities and can results in a smaller pore size and tighter skin tone. This product is guaranteed to be natural. Directions: Mix one tablespoon of NOW Red Clay powder with one teaspoon of water. Thoroughly cover the face and neck avoiding sensitive areas and the eyes, allow to set for 15-20 minutes, rinse off and apply moisturizer. For external use. Ingredients: 100% Pure. NOW Moroccan Red Clay consists of Ilite (a natural mineral silicate).